I'd like to be able to define certain memory ranges as read-only, ie ROM, or as invalid addresses. Writes to "ROM" space would be either ignored or trapped, similarly any access to invalid space would be trapped and an appropriate exception thrown. I'm not sure of the best way the programmer would define this, one option would be to add a directive, another would be to be able to add ranges by way of a TRAP function. I would like user opinions on this feature. Perhaps use could be made of the SECTION command using reserved names such as ROM, RAM, READONLY and INVALID that can be used alone with an address range or appended to a named section with the range of that section defining the addresses. If there is no definition or only ROM or READONLY is defined everything undefined is assumed to be RAM. If RAM is defined everything not RAM, ROM or READONLY is assumed to be INVALID. RAM can be both read and written. ROM can be read and writes will complete the cycle but without writing the data. READONLY can be read but writes will cause a bus error. INVALID will cause a bus error for both reads and writes. Accessing hardware device addresses never cause an error. Also if you're going to add this could we also have the option to wrap all addresses into the $00FFFFFF range like a real MC68000 would do. That might be a good solution. The information would need to be conveyed from the assembler to the simulator. I don't think there is a standard way of doing that in an SRecord file so it would probably be done in the .L68 file. Would there need to be a way to manually configure the memory ranges in the simulator? I've been looking at this. The simulator code does not appear to have an easy fix so no promises. Possible hardware configuration of memory map. The information would need to be conveyed from the assembler to the simulator. I don't think there is a standard way of doing that in an SRecord file so it would probably be done in the .L68 file. Could it not be passed encoded in S0 records? That way it would be present even if the listing file was absent. This new feature sounds very promising, I look forward to giving it a try. I will be a very handy feature to allow for the writing of exception processing code. This will help to make our systems more robust and more stable. Actually I was thinking using the S0 record. I'll need to investigate that possibility. Any violation results in a Bus Error. The memory ranges are conveyed to the Simulator in the .S68 (SRecord) file via S0 records. 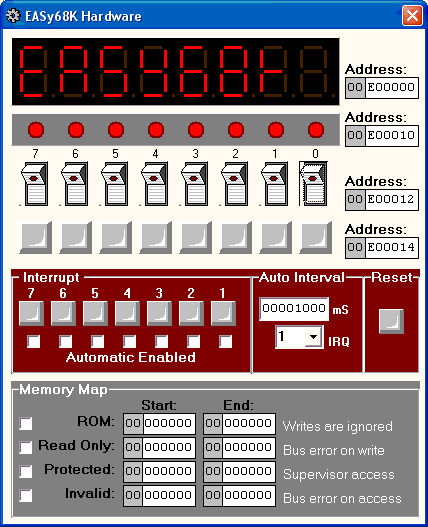 If no Memory ranges are specified in the code they may still be set manually in the Hardware window of the simulator.